Igor Gorgonzola Novara earn their spot in the 2018/19 Italian Women’s Volleyball Championship playoff semifinals after an intense Game 3 of the quarterfinals against Il Bisonte Firenze. 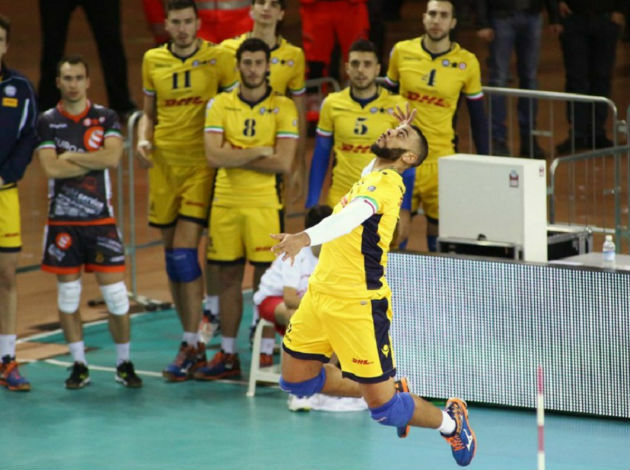 The No.2 seed Novara, who advanced to the 2019 CEV Champions League final a few days ago, was dangerously close to elimination in the 2018/19 Samsung Volley Cup A1 playoffs! The players of the seventh seed Il Bisonte laid down their weapons only after five sets and after having a match point in the tie-break at 15-14 in Game 3 of the quarterfinals. Thanks to Paola Egonu, who finished the match with 33 points (seven aces), Novara canceled it and converted their own match ball for a 3-2 (25-22, 25-22, 21-25-12-25, 17-15) and 2-1 in the series. Dutch Nika Daalderop scored 23 points for Il Bisonte for which Sara Alberti made six kill blocks. The No.4 seed Saugella Team Monza dominated over fifth seed Unet E-Work Busto Arsizio in Game 3 to advance to the semis as well. German Hanna Orthmann noted 19 points for the winning side who made 80% team’s positive reception. The libero Chiara Arcangeli highlighted Monza in this segment with 85%. The Dutch Floortje Meijners scored 18 points for Busto.